Patch the Steampunk Pirate Bear. Now how are you not gonna notice a title like that? 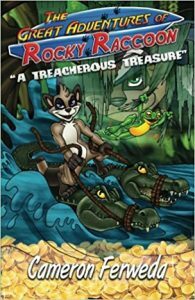 Written, illustrated, and published by Matt Dean, Patch the Steampunk Pirate Bear and the Lost City of Gold is a brand new paperback book for young readers. 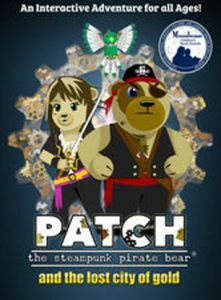 According to Horror House Party, “Patch the Steampunk Pirate Bear and his friend, Sprocket the Mechanical Bird, sail a steam-powered airship on a great adventure sparked by a rescue mission. Chased by his nemesis Captain Caroline, the great teddy-bear hero Patch risks everything to find the Lost City of Gold and save his friend Nikola. But time is running out and Captain Caroline is hot on his tail! Will Patch find Nikola and get his crew home safely before they are shipwrecked and trapped forever?” The official web site is also brand new, but it’s quickly filling up as the author travels the country promoting his book. Some new discoveries from the Los Angeles Times Festival of Books… including some things that maybe Man Was Not Meant To Know! 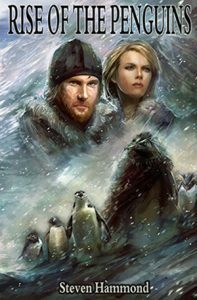 We met author Steve Hammond, who introduced us to his new science fiction saga Rise of the Penguins. “The War of the Species has begun. An ancient race of penguin has reemerged. From this race a powerful leader declares himself Overlord and unites the penguin clans of the world. His goal: to drive the human presence away from Antarctica and to exact revenge for the atrocities of the past against penguinkind. Through shadowy alliances and manipulation the Overlord launches a full scale war against the humans. The Overlord’s tactics are ruthless even against penguins under his command. Those who don’t conform to the Overlord’s ideals are pressed into obedience or worse. In the midst of bloody conflict against the humans a small Chinstrap penguin, Lavour, begins to see the folly of war and questions the motives of the Overlord. 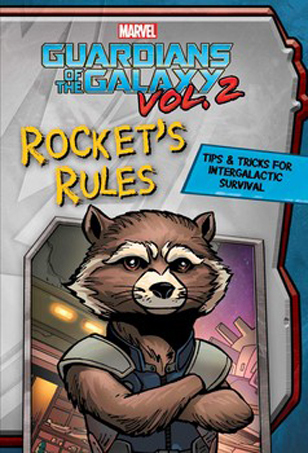 But can one penguin bring an end to the bloodshed and change their course of the war and restore peace?” No less than six books in the series are available now from Rockhopper Books, and a seventh volume is on the way soon. Visit the author’s web site to keep up to date. And remember to treat birds nicely! Once again we have Animation Scoop to thank for this bit of news: David Hale Hand, the son of Disney Legend David Dodd Hand, has a new new Kickstarter campaign up and running to restore his father’s Musical Paintbox series of animated shorts, as well as to update and enhance the Animaland series of shorts (which have previously been released on DVD). If you are not familiar with the elder Hand, check this out: “David Dodd Hand was an Animator and Director, and best known as Supervising Director of Snow White and The Seven Dwarfs (1937) and Bambi (1942). 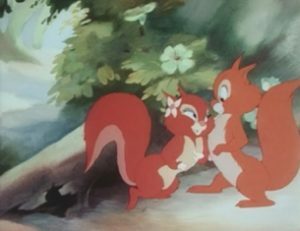 He was also Studio Production Supervisor while he was at the Disney Studios from 1930 – 1944… Leaving Disney, he was creator and Managing Director of Gaumont British Animation (GBA), a J. Arthur Rank Studio, where he created the 19 films about which are the focus of this project.” Those 9 Animaland shorts introduced us to new characters like Ginger Nutt (and his girlfriend Hazel), Oswald Ostrich, and Digger the Platypus. Anthropomorphic characters made their presence known in Musical Paintbox too — a series about the quirky British countryside and its many legends. The Kickstarter campaign has only a couple of weeks left (as of this writing), and contributors will receive digital copies of the restored films, so visit soon. Later this month, Magnetic Press will be releasing the next installment of the Klaw series entitled Klaw: The Second Cycle. Once again it’s a hardcover graphic novel written by Antoine Ozanam and illustrated by Joël Jurion. 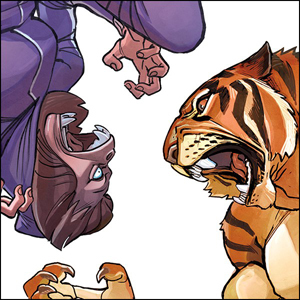 As you may recall, in the first issue of Klaw we met young Angel Tomassini, who discovers several scary things at once: When he’s angry he turns into an anthro-tiger, and his father is a vicious crime boss, and there is a whole society of were-creatures who do not always have each others’ best interests at heart. 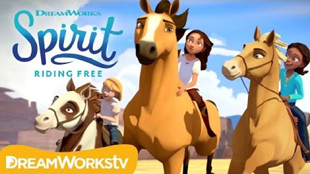 And now: “The second volume in the series follows Angel and his girlfriend Lisa as they flee across the globe from the many dangerous forces that would steal their were-animal spirit for their own nefarious, criminal use. 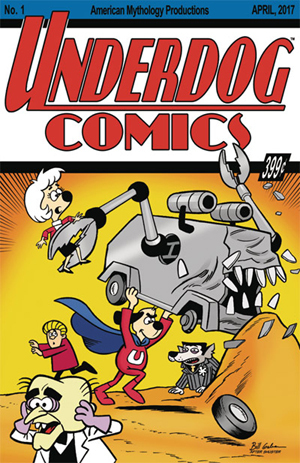 As if spotting and defending themselves from these hidden enemies isn’t hard enough, they also have to keep their own delicate control of their powers in check… innocent lives can get caught in the crossfire, and all the power in the world is useless if you can’t protect your friends and loved ones…” Check out the preview pages. The creator of 100% Soft describes himself this way: “Truck Torrence lives in Los Angeles and makes kawaii pop art under the moniker 100% Soft. 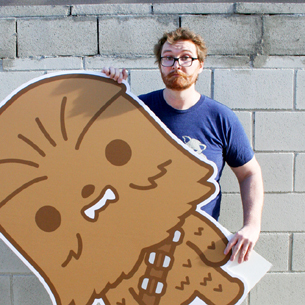 He is the designer of the official emoji for Star Wars and the creator of the Kaiju Kitties. His work has been shown at Gallery 1988, Bottleneck Gallery, Giant Robot, and Spoke Art. His clients have included Lucasfilm, Disney, 20th Century Fox, Fandango, Nickelodeon, and Marvel Studios.” And as you can see on his web site, he’s been busy making emoji, message stickers, plush kaiju kitties, and more for a while now — including an entire set of stickers for Disney’s Zootopia!